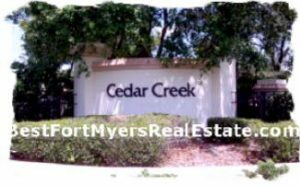 Cedar Creek is a modest sized community of less than 300 single family homes. The community of Cedar Creek is built out. No new construction worries. Only resale properties are available. Homes in Cedar Creek offer panoramic views of tropical preserves, and lakes. A few homes even have views of Spring Creek. Cedar Creek is located in the heart of Bonita Springs, Florida where US 41 and Spring Creek converge. The community was built by Lennar/US Home. Feel free to Contact Shellstar Realty. Our Realtors Have several years experience and can help you obtain the best price on your real estate purchase.